This update on Standing Rock is offered by Paul Kivel from the newsletter on his website, which is packed with resources for racial justice. Wednesday, February 22 was the deadline issued by North Dakota state to clear out the camps established to resist the Dakota Access Pipeline. Most people voluntarily left and those remaining joined the Standing Rock Sioux Tribe to set fire to the tents in accordance with their tradition. Donald Trump had already overridden the Army Corps of Engineers decision not to issue a final easement for the pipeline pending an environmental impact report. On March 7th, a federal judge denied a final motion to suspend construction. However, the chairman of the Standing Rock Sioux Tribe made it clear that this decision would not hinder their larger efforts at blocking construction of the pipeline and that they were standing their ground. Several other tribes have joined in and started filing motions of their own throughout the month of February and the battle to stop the Dakota Access Pipeline has moved into the courts and onto the streets. The march from the headquarters of the US Army Corps of Engineers to the White House on March 10th concluded a week full of workshops, panels, and gatherings protesting the Dakota Access Pipeline construction project by indigenous participants from across the US, Mexico, and Canada. 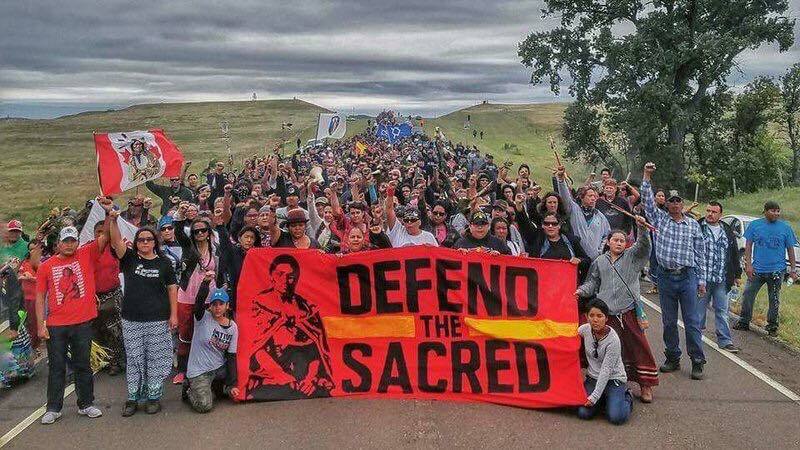 While realizing a setback at Standing Rock, the larger Native American-led movement for indigenous sovereignty and to stop the fossil fuel industry continues to gain momentum throughout the Americas and in countries such as Japan and Norway. Seattle and San Francisco and several smaller cities, universities and pension funds have already divested from the pipeline and specifically from Wells Fargo and other banks. Where do you bank? Check out a local credit union and think about moving your money. This page was set up for a SURJ Political Education call held in the fall of 2016. For updates about the situation at Standing Rock, please visit the Standing Rock Sioux Tribe Facebook page. SURJers Liza Minno Bloom and Berkley Carnine offer their experience and perspective in Towards Decolonization and Settler Responsibility: Reflections on a Decade of Indigenous Solidarity Organizing. Both have worked with the Black Mesa Indigenous Support (BMIS) collective in solidarity with the Dineh people of Black Mesa, AZ, who are resisting a forced relocation due to coal mining, the largest relocation of Indigenous people in this country since the Trail of Tears. This writing and work relates to us—as white settlers acting in solidarity with an Indigenous struggle—proactively pursuing decolonization and anti-colonial work amongst ourselves. It is one of many attempts to disrupt the narrative that says decolonization and anti-colonial work are solely the job of Indigenous people and to explore what we are calling parallel processes of decolonization. We are thinking through what it means to shift out of a solely solidarity framework to one of joint struggle, wherein we clarify our own sense of having a stake in defending the earth and in confronting systemic violence and intergenerational trauma caused by colonialism. As both authors identify as white settlers–people of European descent who benefit from both white privilege and settler privilege–we work and write from our perspective. Developing and acting upon a mutual stake in decolonization looks different for non-Native white people and non-Native people of color. Since we are white settlers, we are focusing on the responsibilities specific to that position. We want to express gratitude for the activist scholarship and organizing of Indigenous and non-Native people of color who’ve greatly informed our analysis and have included a list of resources of many of those writings in the Action Steps/ Best Practices. We’ve had to figure out how to listen closely to oral stories, and take seriously protocol for how and why to do things that do not make sense in a Western worldview. From IEN website: In North Dakota, Indigenous leaders from the Standing Rock Nation are fighting the Dakota Access Pipeline (DAPL). This pipeline will carry over a half a million barrels of oil per day from the Bakken Oil Shale Fields. The route the pipeline will take, if approved, will be laid under multiple bodies of water, to include the Missouri River located a half mile upstream from the Standing Rock reservation. This river not only supplies drinking water to the tribe but is a major tributary to the Mississippi River where more than 10 million people depend on it for both human consumption and irrigation for the nation’s “bread basket.” This pipeline when it fails – and it will fail – will destroy land and water with little, if any, chance of remediation / cleanup. We only need to look at the devastating Yellowstone River, Kalamazoo, and many others. Protesters have continued to resist construction peacefully, despite surveillance and intimidation from the state. Click here to learn more – find out how you can join them – support them – and spread the word of this historic coming together of many nations to protect our precious water for the next Seven Generations. If you're able to go to Standing Rock, sign up here. Then make sure to review the resources in the Standing Rock Allies Resource Packet - includes four documents prepared by members of the Solidariteam working with the Standing Rock Sioux Tribe. The Oceti Sakowin Camp Protocols were written with camp elders. The documents include instructions for what to do if you're thinking about going to Standing Rock, a tool explaining what it means to and how to join and respect camp culture, the Oceti Sakowin Camp Protocol: 7 Lakota Values, and what to do when you return home. If you'd like to organize an action locally to put pressure on the targets identified by organizers on the ground, head here. The Standing Rock Sioux Tribe offers options for solidarity on their webpage for those who cannot go. Sacred Stone Camp legal defense fund and general camp fund. Red Warrior Camp is set up to facilitate direct action and they have a legal defense fund and a general camp fund, including winterization. Standing Rock Sioux Tribe has a Dakota Pipeline Donation Fund for support. Sunday night, November 20, 2016, police used tear gas, rubber bullets, and water cannons on water protectors in 26 degree weather. Hundreds of people were injured, several hospitalized, and one woman was severely injured when a concussion grenade hit her arm. Read an update here. Last week, Army Corps of Engineers put out this statement offering to consult with with the Standing Rock Sioux Tribe about ways to proceed with the Lake Oahe crossing. The resounding response from the Standing Rock Sioux Tribe is “We Cannot Negotiate for the Water.” DAPL’s response has been to sue the Standing Rock Sioux Tribe, the Cheyenne River Sioux Tribe, and the Army Corps saying all permits have been granted. The project is financially unstable which is why DAPL is willing to disregard Army Corps and prepare to drill. Independent media reports that the horizontal drill has been moved to DAPL’s highly fortified drill site and is preparing to drill under the river. Now is the time for sustained and intensified solidarity action. Each day, water protectors take bold and prayerful action to ensure DAPL will not drill under Lake Oahe and that water is protected, not negotiated away. As DAPL threatens to drill without a permit, we must continue taking action around the country targeting banks funding DAPL, pipeline corporations, Army Corps, the transportation of materials headed to the Bakken oil fields, and, when possible, joining protectors on the frontlines. Last Saturday, five hundred people gathered in Mandan, North Dakota. 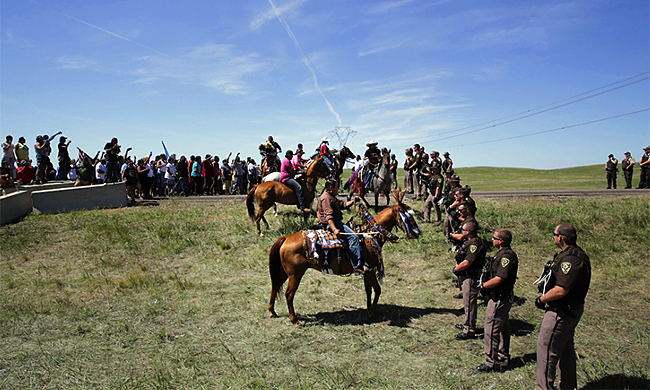 The Oceti Sakowin chapter of the American Indian Movement, Black Lives Matter, Brown Berets, the Indian Problem, and La Red PICO held a prayer ceremony that ended with white allies providing a buffer for protection from riot police. The post-Trump election calls for these examples of unity in action. Follow this link for pictures of the action taken by photographer and water protector Desiree Kane. Move your money from banks and institutions funding DAPL. . Ask your family and friends to move their money out of banks funding DAPL: Defund DAPL info. This document will tell you how to hold Citigroup accountable with a template for reporting a violation. Here is a map of the financial, governmental and corporate targets behind DAPL to make it easier for you to locate where to hold an action near where you live. If there are no corporate or governmental targets in your area, please reach out and we will find a way for you to plug in. Also, if you need guidance on how to go about escalating actions, please let us know. Remember WATER IS LIFE! Here is a link with the locations of Army Corps offices at which to hold actions. Support the frontline: Always needed are supplies, and folks with experience or skills in winter camping and winterizing, direct action, construction, chopping/hauling wood, cooking, dishes, childcare, etc. It is especially useful to commit to 2 weeks or longer. White people are expected to be arrestable. White folks, Please read these before going to Standing Rock. Continue building and deepening solidarity with Indigenous struggles for water protection, sacred sites, sovereignty, and mother earth in your region. NYC Stands with Standing Rock Collective created this syllabus to provide support to those resisting construction of the Dakota Access Pipeline and those who want to better understand the history of this fight. The different sections and articles place what is happening now in a broader historical, political, economic, and social context going back over 500 years to the first expeditions of Columbus, the founding of the United States on slavery, private property, and dispossession, and the rise of global carbon supply and demand. This syllabus brings together the work of Indigenous and allied activists and scholars: anthropologists, historians, environmental scientists, and legal scholars, all of whom contribute important insights into the conflicts between Indigenous sovereignty and resource extraction. While our primary goal is to stop the Dakota Access Pipeline, we recognize that Standing Rock is one frontline of many around the world. This syllabus can be a tool to access research usually kept hidden, or a resource for those unfamiliar with Indigenous histories and politics. Share, add, and discuss using the hashtag #StandingRockSyllabus on Facebook, Twitter, or other social media. Like those on frontlines, we are here for as long as it takes. ​This book, Undoing Border Imperialism by Harsha Wahia, offers relevant insights for all social movement organizers on effective strategies to overcome the barriers and borders within movements in order to cultivate fierce, loving, and sustainable communities of resistance striving toward liberation. Harsha Wallia speaks to moving beyond a politics of solidarity to a practice of decolonization. A Canadian take on settler responsibility for relationship and the Idle No More movement. Another Canadian take on the terms of engagement with Indigenous Nationhood. The Unsettling America website covers issues of decolonization in theory and practice. Based in Canada. Roxanne Dunbar-Ortiz offers the first history of the United States told from the perspective of Indigenous peoples. The book spans more than four hundred years of history and speaks to the active resistance of Indigenous peoples over these centuries. A thorough examination of the problems that can arise when activists from colonial backgrounds seek to be politically supportive of indigenous struggles. Discusses how the impulses that drive middle-class activists to support indigenous peoples will not lead to successful alliances and meaningful social change without an essential process of public political action and critical self-reflection. Essays that take up themes of Indigenous societies as cultures of resistance, including legal resistance, contemporary Native religious practices, and Native challenges to academia. The word Wasáse is the Kanienkeha (Mohawk) word for the ancient war dance ceremony of unity, strength, and commitment to action. The book traces the journey of those Indigenous people who have found a way to transcend the colonial identities which are the legacy of our history and live as Onkwehonwe, original people. Alliances brings together Indigenous and non-Indigenous leaders, activists, and scholars to examine their experiences of alliance-building for Indigenous rights and for social and environmental justice.